A couple months ago we received a new battery line from Scorpion. These new batteries are an example of the latest and greatest in battery technology, and represent a giant leap forward in Powersports starting applications. We’ve actually been secretly testing these batteries for the last year in a few applications, including a Harley Sportster and an offroad KTM. You might be thinking, “meh…who cares” If that is the case, hang on and I will lay out some of the advantages, as well as some of the pitfalls of going to a LiFePo4 battery in your ride. 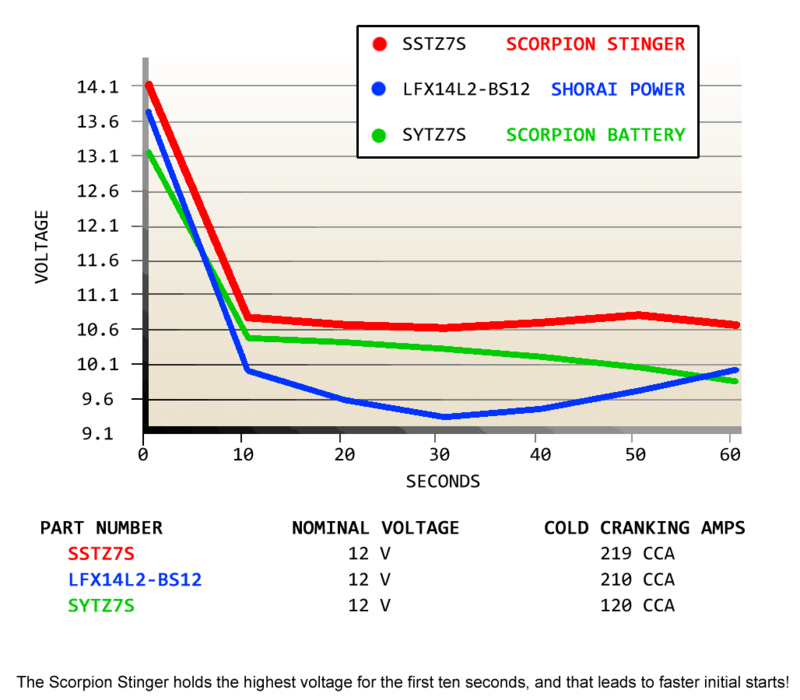 Scorpion Stinger batteries also hold a higher resting voltage than typical Powersports batteries. When it comes to electricity, Voltage = pressure. Pressure (or in this case voltage) is what turns your starter over. So in effect, a higher voltage will turn your starter motor over faster than one with a lower voltage. Our testing has shown that for the first 10 seconds of load, or cranking, the Scorpion Stinger holds up to 1 volt higher than Lead, and nearly the same over other LiFePo4 batteries we have tested. Ok, I mentioned that there are some pitfalls. The first is that while these are great starting batteries, they are not designed for zero loss, or deep cycle applications. They are designed with weight in mind and will not perform as well as a lead battery when cycled deeply. Secondly, they are a bit more sensitive to temperature than Lead batteries. They don’t perform as well as a comparable AGM type battery when the temperature drops below about 20 degrees, and they also are more sensitive to heat. We don’t recommend these be installed in an application where the battery cannot get any cooling air, such as surrounded by an oil tank, or directly on top of a motor. Third, they must not be charged at over 15.0 volts. ALWAYS check your charging system prior to installation to make sure your stator or alternator never produces more than that 15.0 volts. Higher voltage can cause these batteries to melt down. Fourth, they are not as tolerant to parasite draws like the Lead Acid batteries they are replacing. As mentioned they are only 1/3 the capacity of the lead acid battery they typically replace. This means a parasite draw will draw them down quicker than your lead acid battery, so if you have a parasite draw you need to make sure you are maintaining the battery with a lithium charger. Excessively discharging the battery will harm the lithium rendering it unable to hold under load, and that is not covered under warranty. One more thing. Despite what may be a common misconception, Lithium batteries are actually much cleaner and greener than the lead based batteries that they are replacing. Everything from the manufacturing process to end of life disposal is easier on our environment and produces less waste than old acid batteries.